That said, it hasn’t always been easy to juggle work with travel (not to mention our regular life) and we’re still trying to figure out the right balance for us. 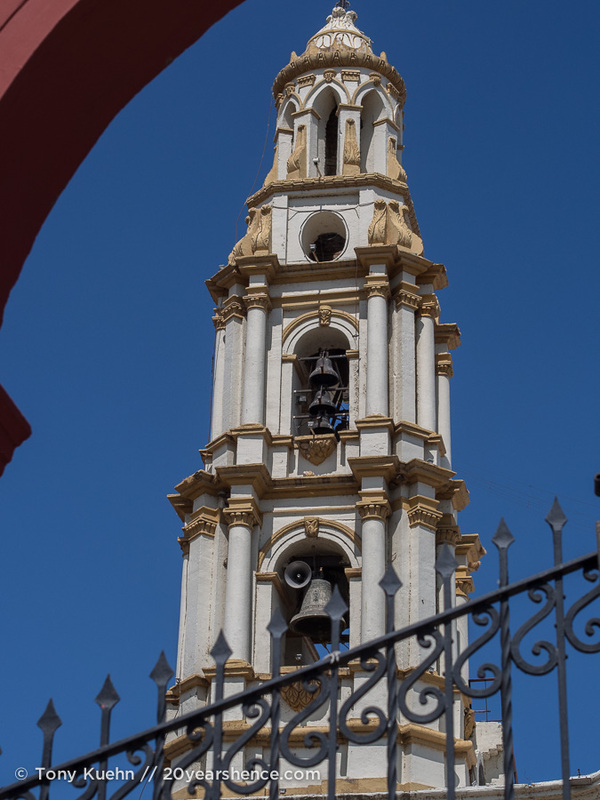 During our month in Tlaquepaque, we found ourselves with very full plates when we decided to add Spanish language classes to our preexisting work commitments. From Monday to Friday, it felt that the bulk of our sightseeing was simply whatever we happened to take in on our route to and from our apartment and school and meals. In some ways, it was kind of nice to turn off the planning part of our brains and just relax into the routine of a schedule, but it also didn’t take very long for us to start to feel a bit antsy and stifled. Eventually, we came to anticipate the weekend like Pavlov’s dogs waiting for a bell. After two weeks of classes, we decided to give ourselves a day of play—to get a taste of what retired life might look for us, we decided to head to Ajijic. Ajijic is pronounced “Ah-hee-heek” NOT “Ah-jee-jeek”. We’ve also seen some interesting pronunciation guides for Tlaquepaque too, so for the record, that’s “Tla-kay-pah-kay”. 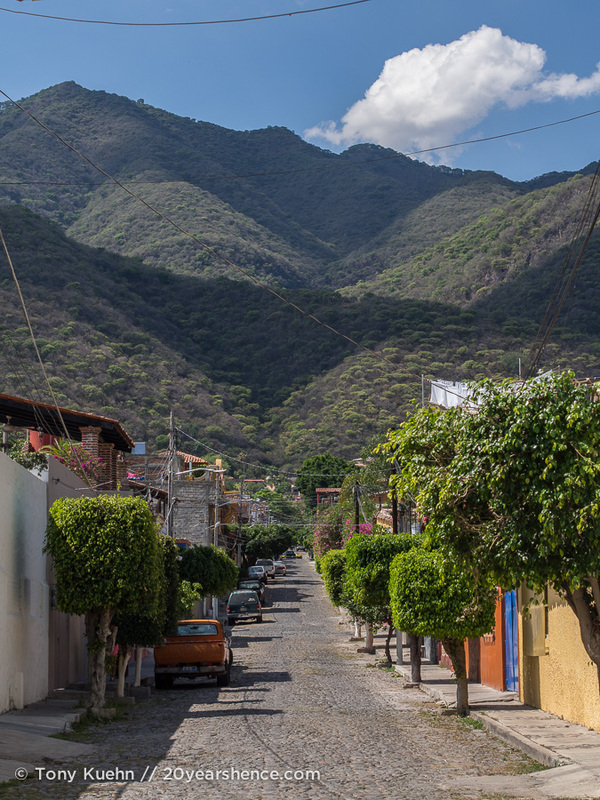 For those of you not up on your Mexican migration patterns, Ajijic is one the country’s top destinations for Canadian and American retirees. 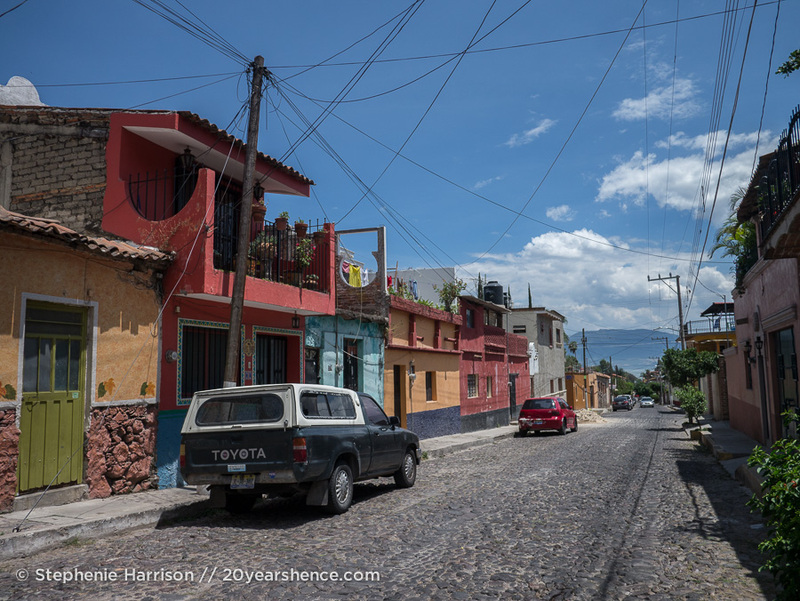 Situated right on Lake Chapala—the largest freshwater lake in Mexico—it boasts temperate weather year round, but is especially popular with the over-60 set in the winter. We had read that it was very gringofied (the kind of place where you were more likely to hear English on the streets than Spanish) and kind of expensive, but to be perfectly honest, blog posts about Ajijic are kind of non-existent and even our not-so-trusty Lonely Planet guide was relatively tight-lipped about things to see and do there. 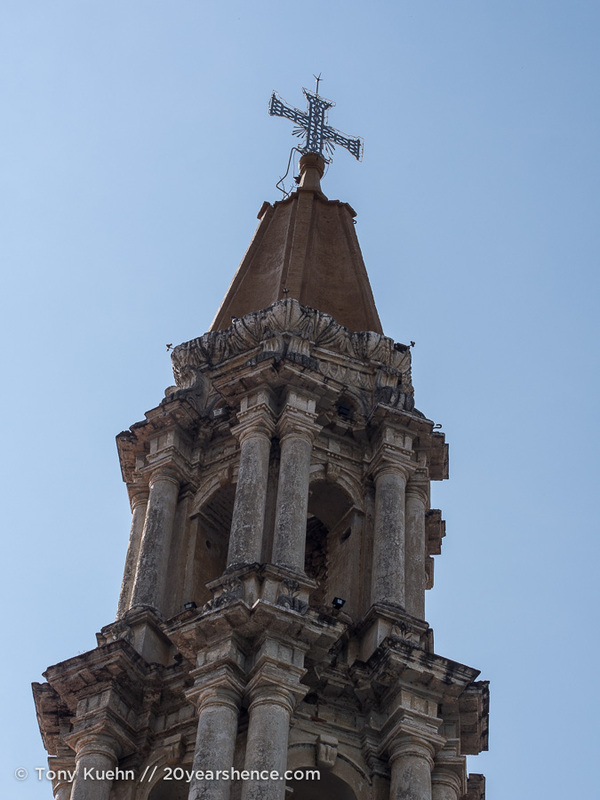 At less than an hour from Guadalajara by car, we figured we had nothing to lose by checking it out, but we really had no idea what we would find at our destination. 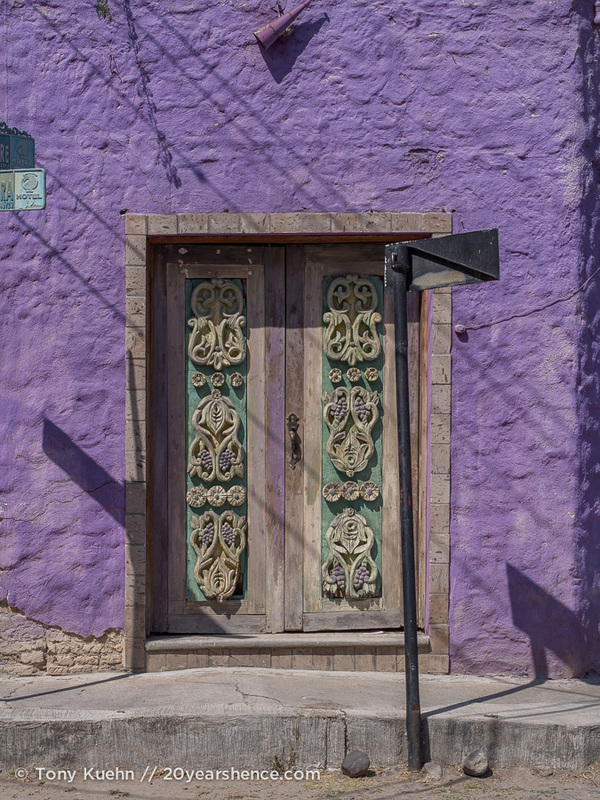 The drive to Ajijic is on a major multi-lane highway, so what it lacks in scenery it makes up for in comfort and convenience. 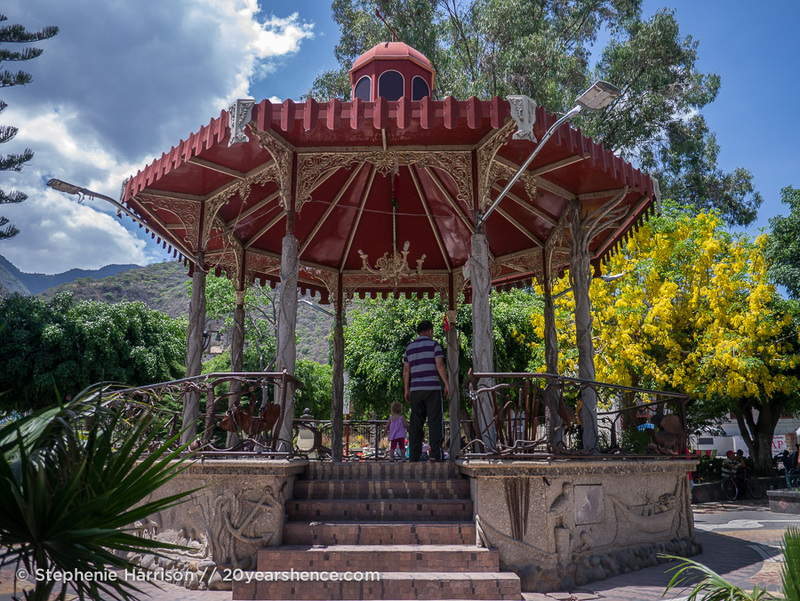 Within 45 minutes, the hustle and bustle of Guadalajara had melted away and we were pulling into the quaint little town of Chapala. 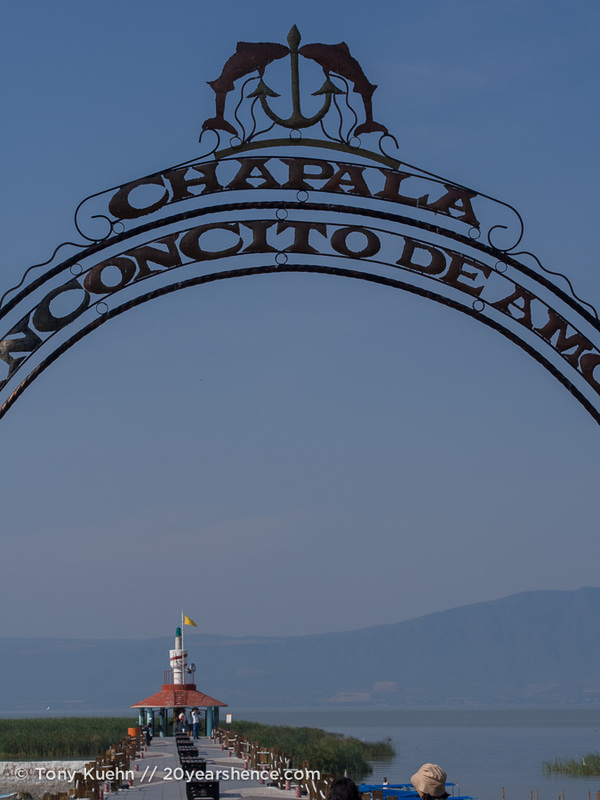 Whether Chapala is named after the lake or vice versa, I’m not sure. What I do know (and as you might have guessed given its name) is that the lake isn’t just Chapala’s major attraction, it’s its only one. Apparently a popular diversion is to charter a boat and visit one of the two islands within the lake, but since we were really just popping by, we elected to simply stroll along the boardwalk instead. It was a pretty stroll, though if I’m being completely honest, the water didn’t smell very good. In recent years, fertilizer runoff into the lake has caused water hyacinth to invade which has killed off much of the aquatic life. 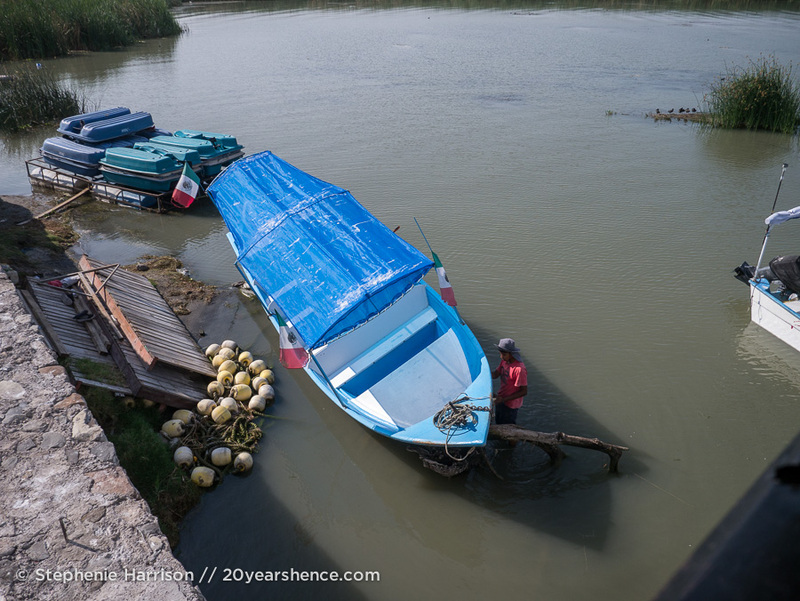 There are still active fishing boats (but given the odor of the lake, the thought of eating anything that came out of it wasn’t very appealing) and we did see a few Mexicans splashing about in the water, but we weren’t overly upset that we had left our swimsuits at home. 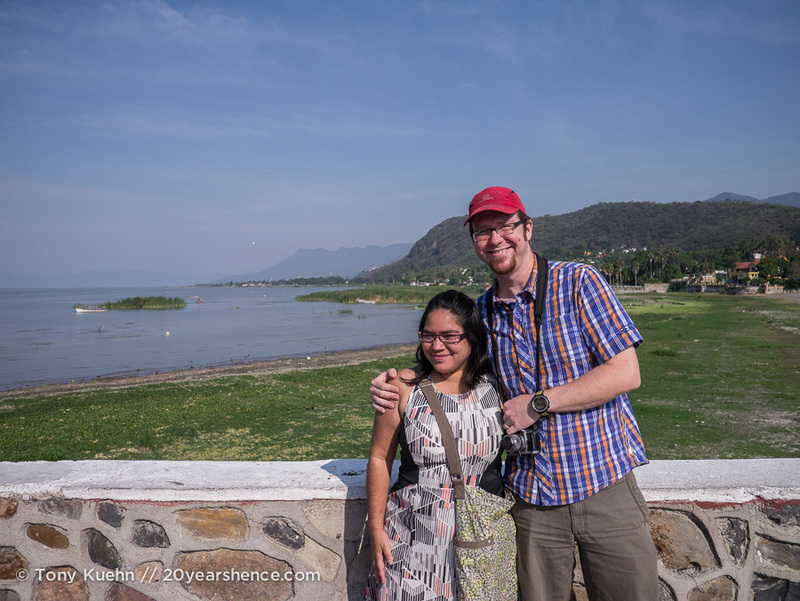 As pretty as Lake Chapala is, after about thirty minutes wandering along the shore and taking photos, we were ready to go. 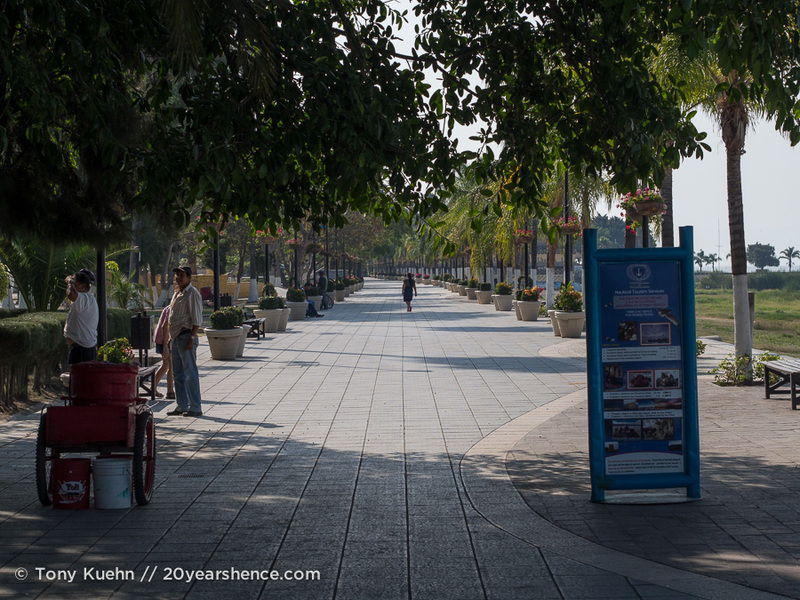 The main boardwalk area was pleasant, but there just wasn’t much else to the town, so we got back in the car and continued on to Ajijic. 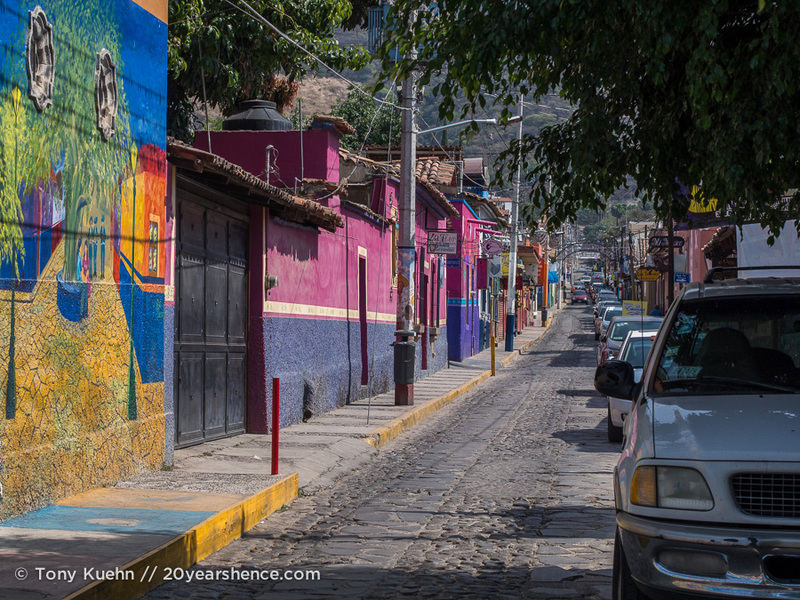 Here’s the thing about Ajijic: it’s super colorful and super cute. It has a lot of restaurants (some expensive and aimed at gringos, some very affordable and clearly catering to locals), lots of little boutiques, a real estate office on every block, and a beautiful central square that is surrounded by lush flowers and vendors selling ethnic jewelry and fresh berries. 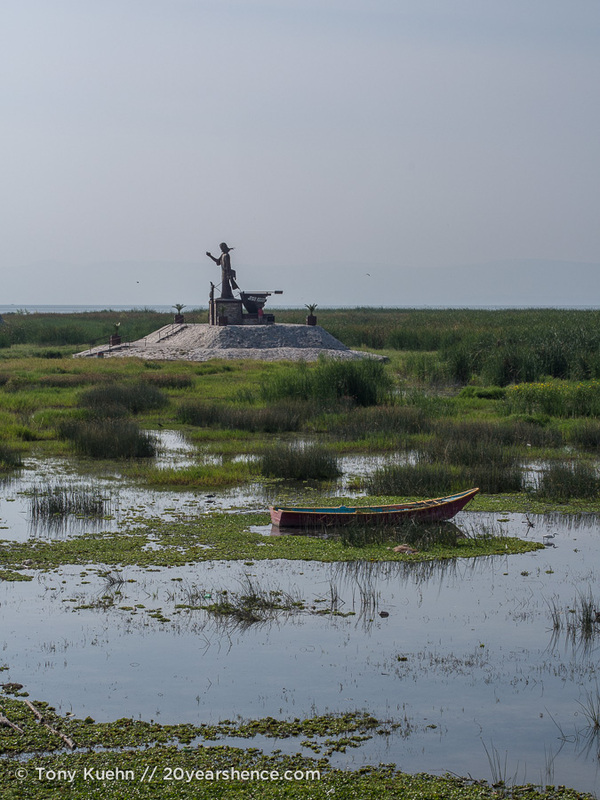 Sure the lake still smells as off-putting here as it did in Chapala, but I suppose that is to be expected. It’s not hard to see why so many gringos love it here. However, it soon became clear to us why there aren’t tons of blog posts or pages upon pages in guidebooks singing Ajijic’s praises. As charming as the town is, it just doesn’t have very much for day trippers to do. 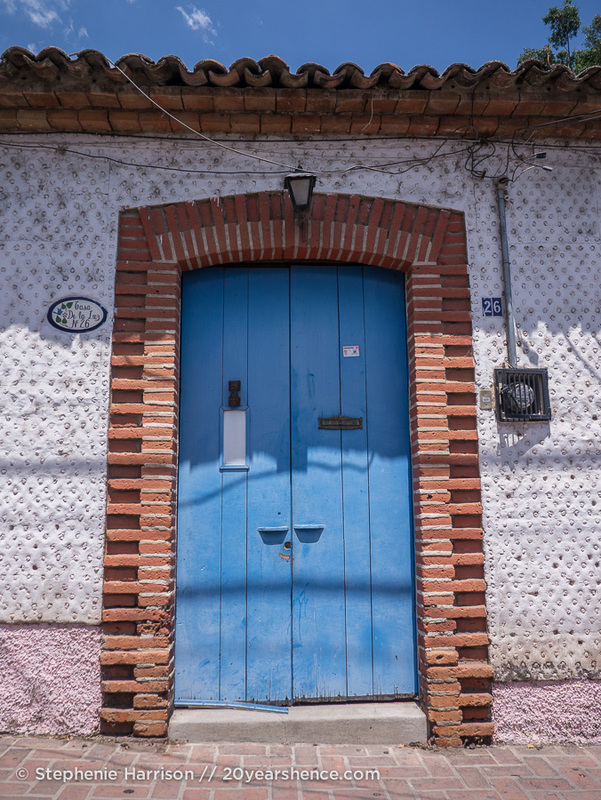 Because we have little-to-no-interest in shopping, we instead spent several hours wandering the streets of Ajijic, taking pictures of the colorful buildings and beautiful doors on the houses. That really made up the bulk of our time there. 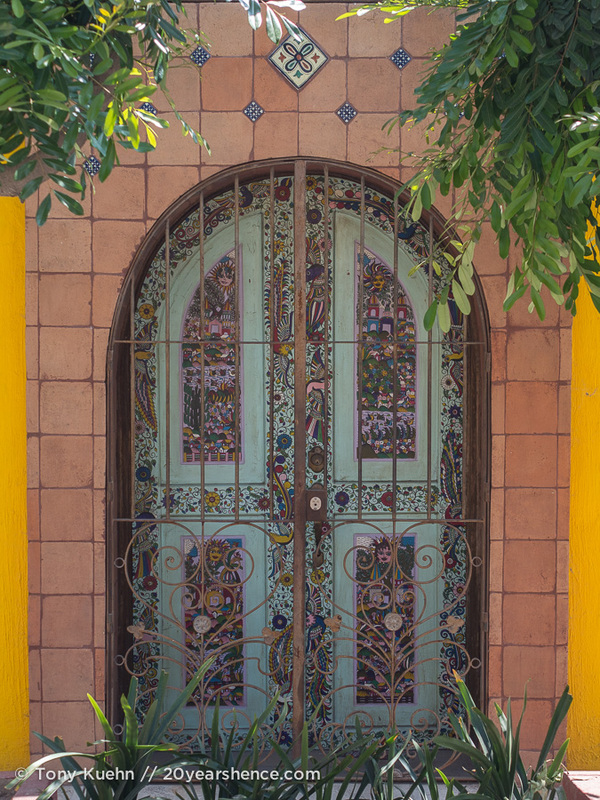 Granted, we did see some really pretty doors, but we need a little bit more from a destination than that. From a cultural perspective, Ajijic is an interesting experiment, I think. Although there is a clear gringo presence, it hasn’t completely obliterated the original grassroots Mexican vibe of that town. 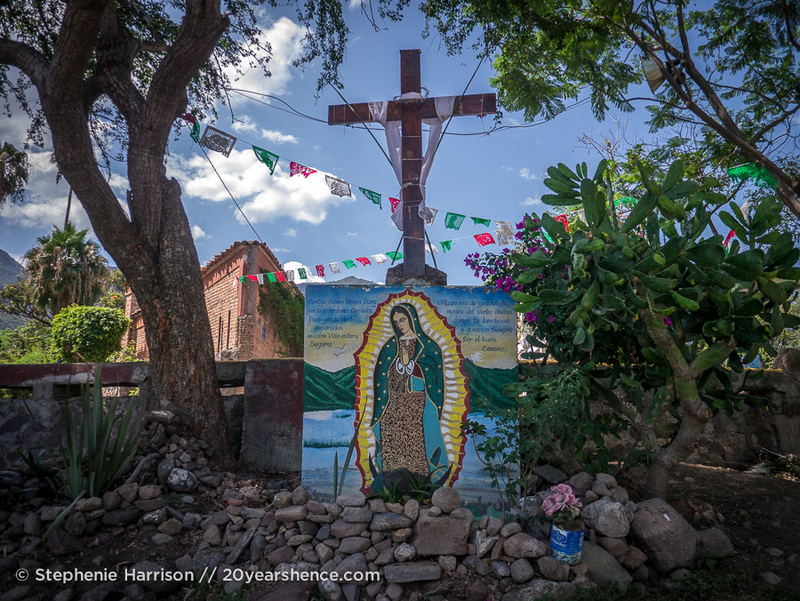 It does exhibit a blend of blend of cultures—we saw plenty of Mexicans out strolling with their families amidst the gringos—and there is a hum of energy there that is still distinctly Mexican. 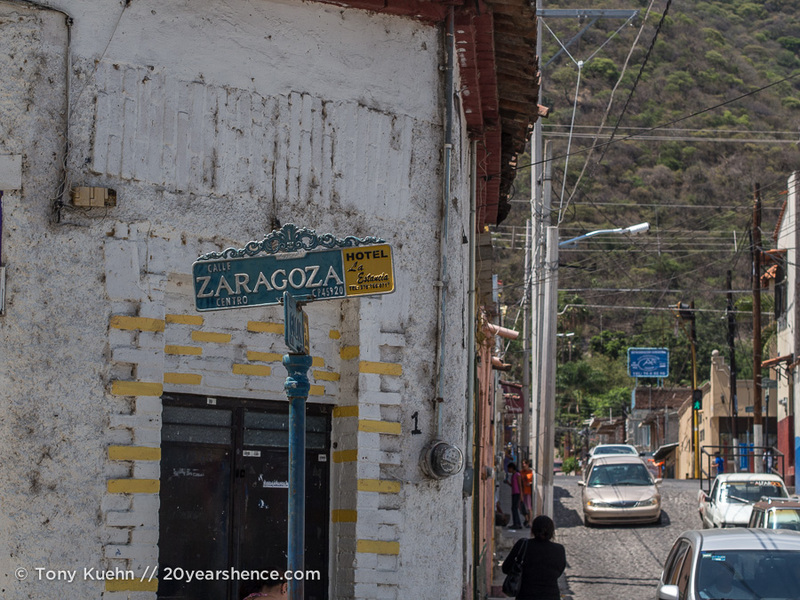 At its core, it still feels like a sleepy town that shuts up shop around 5 or 6 (probably because most inhabitants are rushing off to early-bird dinners! ), and doesn’t even bother getting out of bed on Sundays. As a diversion from big city life, Ajijic was a nice change of pace. But we are big city people through and through, so an afternoon there was more than enough for us; we both agreed that even though we weren’t expecting a wild and raucous party haven a month-long stint there would likely drive us crazy with boredom if the utter lack of street food didn’t push us over the edge first. Perhaps the retired life is just not for us, or perhaps we’ll just need another 30 years before it truly appeals. For now, the world of line dancing and shuffleboard—even somewhere as picture perfect as Ajijic—will just have to wait! 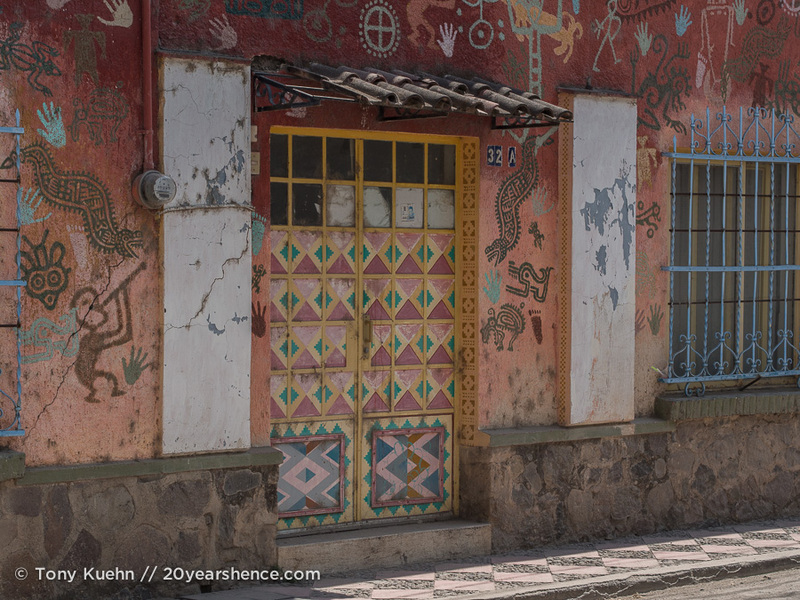 Tell Us: Do you love big cities too, or does Ajijic look like heaven on earth to you? What would be a deal-breaker for you in considering a move to a new place? I fell in love with those colorful doors. Maybe it is because my age better fits the demographics of the area, but it looks pretty inviting to me. Perhaps a week or two for some R&R, but I think a little too sleepy for any long term commitment. For me to want to put down some roots it would need to have a good variety of social interactions, great weather, cultural and historical sites to explore, flavorful and healthy eating options, and of course a reasonable cost of living. 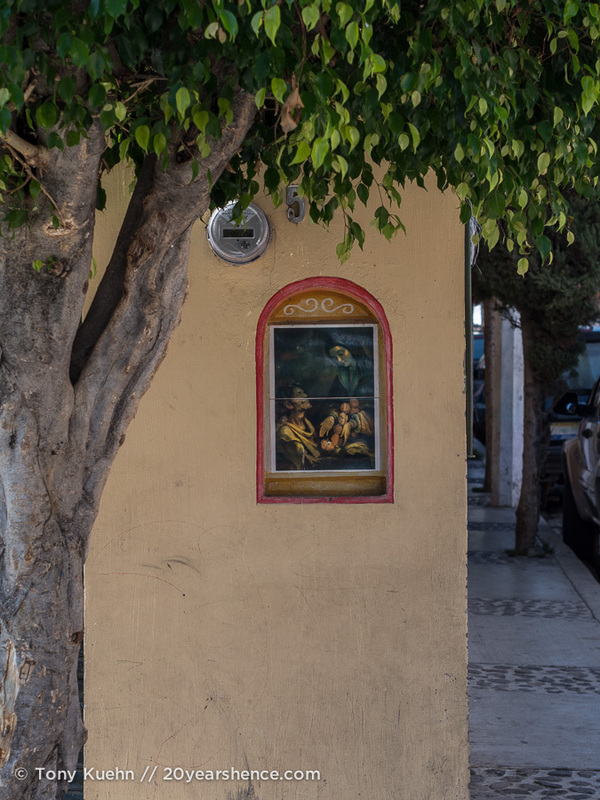 I think for us, the main drawback that we could see to spending a lot of time in Ajijic is that it didn’t have those cultural/historical sites that you mention and some of the Mexican streetlife we now take as a given here wasn’t present. Yes, there were a lot of people in the main square, but we didn’t see any food markets during our walk around town, and there wasn’t any street food either. Maybe if we had stayed after dark we would have seen them, but that would be a huge issue for us. I do think that if you were there longer it would not be hard to make friends and join some groups—people there seemed very friendly, and the weather is very nice! For a few weeks of R&R, it would be a good place to decompress, I’m sure, but it was definitely too sleepy for us. I love this — every once in a while Sergey and I will go off to to a quaint little town, do the stroll on the embankment (if one is present), explore the main town center, sit and people watch, have a meal, do more strolling, and by the time we leave we are so ready to get back to a big city its not even funny how fast we walk to our car. 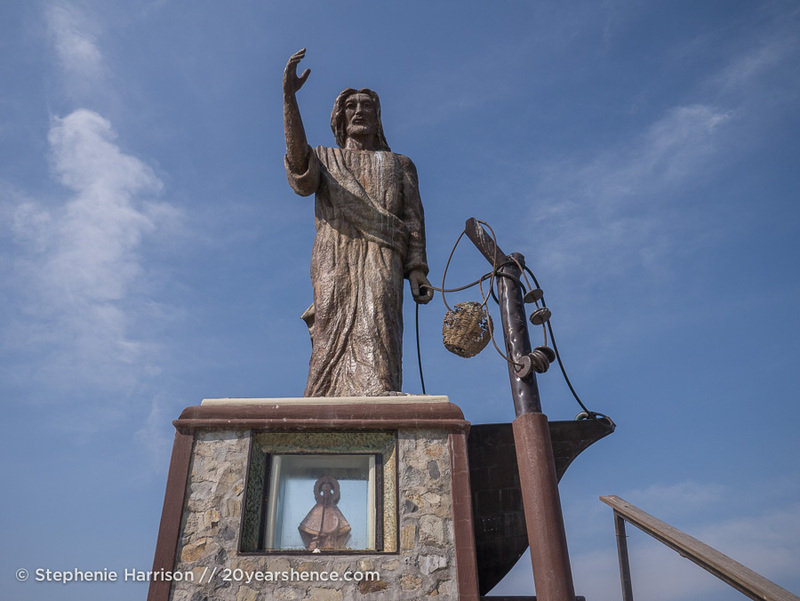 The latest experiment was the town of Saint Luis Obispo in California (named by Oprah as the happiest place in the USA) — after half a day we were extremely ready to be back to LA (or any big city for that matter). But at least I take comfort in the fact that it’s not the town, it’s us! I can certainly see the appeal – Ajijic is button cute. But I’m with you, I would need a lot more to do. I’ve always been amazed by how many people are content to retire next to a beach, lake, or golf course and do nothing more than relax for 20+years. I’d last maybe one week! “Button cute” –> Ha! I love that! It’s also very apt. I am one of those people who always has to have something on the go… I mean, just look: Even when we dropped out of life to go traveling for a few years I had to start a travel blog because I just couldn’t be without a project! 😉 Ajijic was nice for a day, but I’d be catching the bus outta there with you after a week, that’s for sure! Ajijic looks rather nice. I do like quaint little towns and villages with history and culture as. That’s especailly why I really like living in Berlin. Yes, it’s Germany’s capital city but only 3.7 million people live here and it’s so green that every suburb is totally different AND we have an amazing amounts of lakes and rivers. It’s paradise on a bus LOL! Victoria@ The British Berliner recently posted..The Queen came to Berlin. I’m British so pass me the Pimms! I had no idea Berlin was so tiny! Perhaps because it has so much diversity and has so much culture it feels like a much bigger city… and I suppose having all those different suburbs helps too. That said, while I don’t think you’d run out of things to do (or eat!) in Berlin, I’m not sure the same could be said about Ajijic. Nice for a day (or two…), but then it’s time to move on! in Mexico. But where? And doing what? Well, one problem for us is that we travel as a couple and neither of us is a native Spanish speaker, so our default is to always talk in English. That said, wanting to chat with the locals has certainly motivated us through Spanish classes and to keep up our own studying and practice and I do think that spending time with the locals is necessary for true integration. 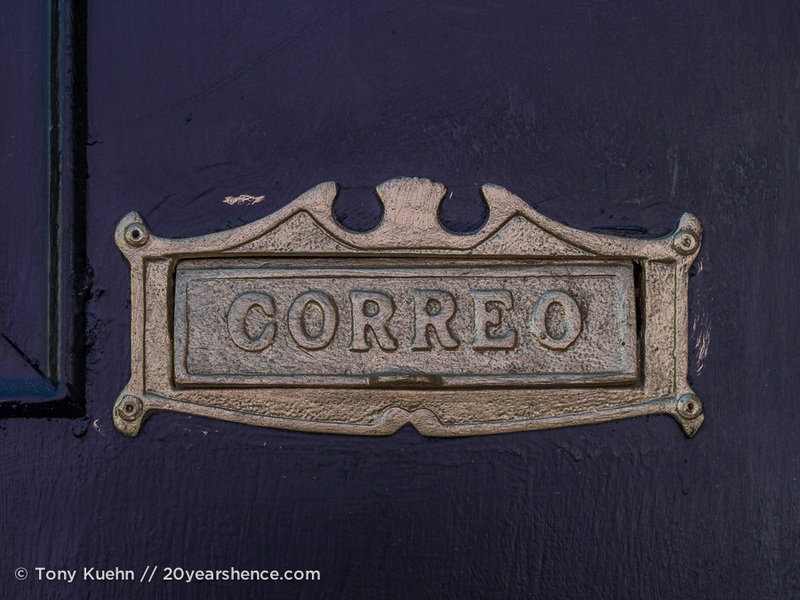 As for where you might be happy in Mexico, well… it all depends on you! It’s such a diverse country and what works for others may not work for you. 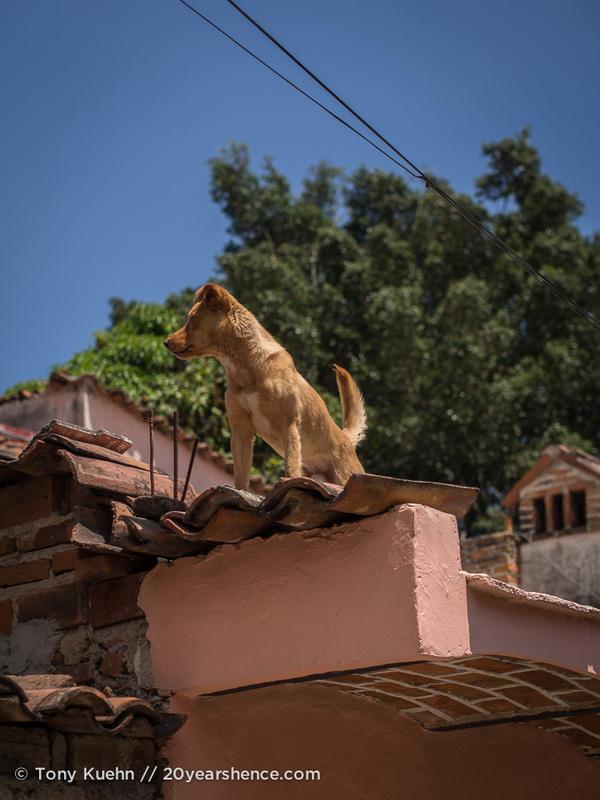 We learned after our first month here that the Riviera Nayarit, though very popular with many other travel bloggers, really wasn’t the right fit for us, but we couldn’t have known that before we arrived. 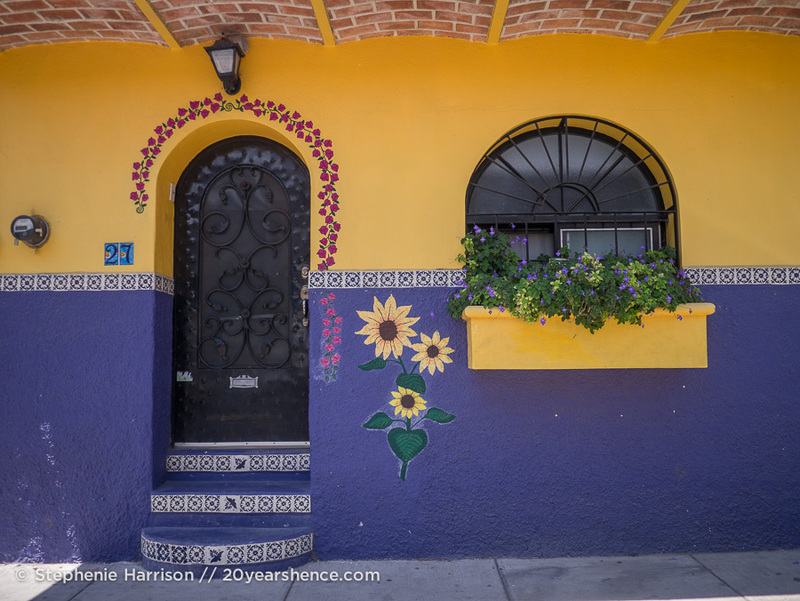 Happily, there are a lot of great places in Mexico, so if you don’t click with one, it’s fairly easy to move on to the next one and see if that works better for you. I have always been curious about Ajijic. I see a lot of housesitting jobs posted for there. Lots of foreigner retirees = lots of housesits! Sounds like the type of place you go to to hide out and work too much for a few weeks. On an unrelated note – Steph, that DRESS in the first photo!! Is it travel friendly (not so wrinkly and withstands any washing machine I throw it in) and where did you get it? LOVE LOVE LOVE it. We have seen a lot of housesitting jobs in Ajijic too, which is part of why we decided to visit. I definitely think you would get a lot of owrk done there, and it’s not like the town is ugly, but we just like places that are a little more happening (and have street food!). If I were living in someone else’s house for free, I could probably do a month there, but I don’t think I would pay to spend an extended period of time there. As for the dress, it is from Target! I actually bought it back in Feb or March, right before we left, so I have no idea if it’s still in stores. It’s a great lycra-y type fabric, so it actually doesn’t wrinkle at ALL and doesn’t require any kind of delicate care whatsoever. It’s not as light and doesn’t pack down as small as my cotton dresses, but it doesn’t wrinkle either so I’m happy with it. 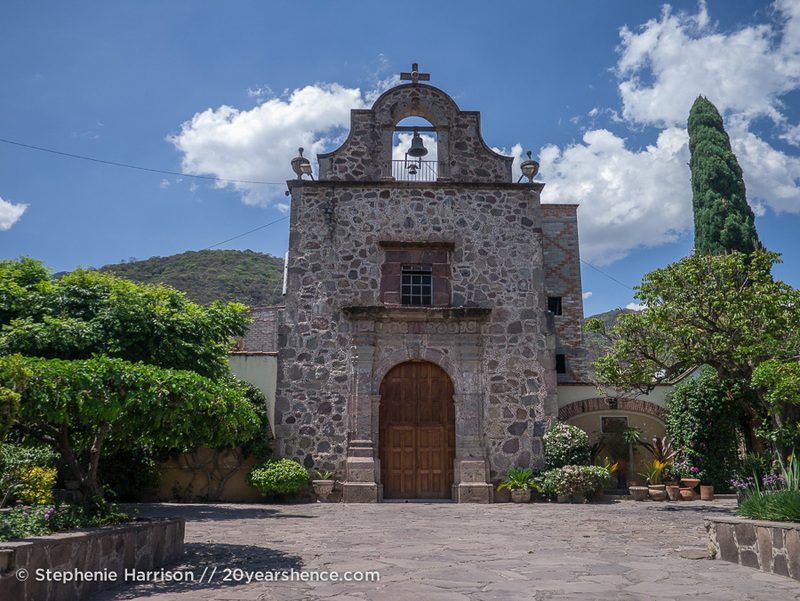 I remember going to the immigration office (hell on earth) and there were loads of said retirees there in line for the paperwork in oder to retire in Chapala. I never visited Chapala or Ajijic but I remember my classmates and friends who went reported back with some mixed reviews. Doesn’t look too bad to me, but I don’t see myself lingering too long either! I don’t see any current comments but thought I would pay my respects to the Ajijic area! 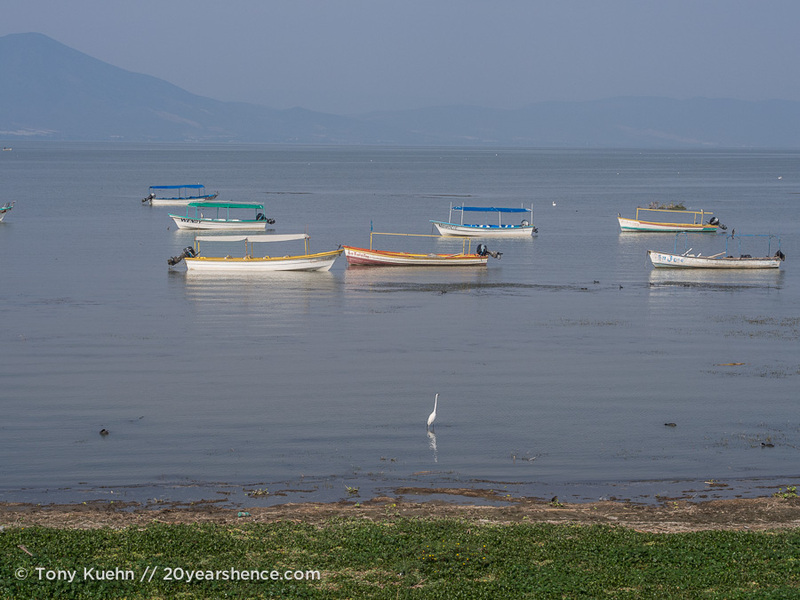 We started spending winter months on Lake Chapala 5 years ago….and every year we Love it more. The climate is perfecto year round, we live at almost a mile high in elevation and the Mexicans are warm and loving, families and their Faith are most important to them…….I for one respect this. They are terribly hard working and work long hours 7 days a week to feed their families….. even then just getting by…… and on average the hourly rate here is 70+ pesos per day or less than $4 US dollars! Lucky ones may do better by working selling vegetables and fruits and berries at a roadside stand in any spare time they might have while the women work at roadside stands selling Mexican fare…… saw a sign yesterday where you could get 4 tacos for 12 pesos or 60 cents US. All this with children with them while they work, always, especially the women. We have met friend with the means to support 10 -12 kids and their families each year. We not only pay the tuition but another $100 US or so to help with immunizations, uniforms and supplies and just a little in case the families fall on even more difficult times. There you have it. We each have different stories of our journeys to this country. Our lives have been enhanced 10 fold with our new found friends from the U.S., Canada, England and Our Mexican friends! We feel fortunate every day we wake up here to blue skies, lots of bird voices .. knowing that another day of comfort and simplicity awaits. As with Donna I will pay tribute to Ajijic to enlighten those of you who think it’s a sleepy little town! I have spent 6 weeks there for the past two seasons now. I am not sure what day or time of day you visited the village but it is odd the streets were so empty of people. 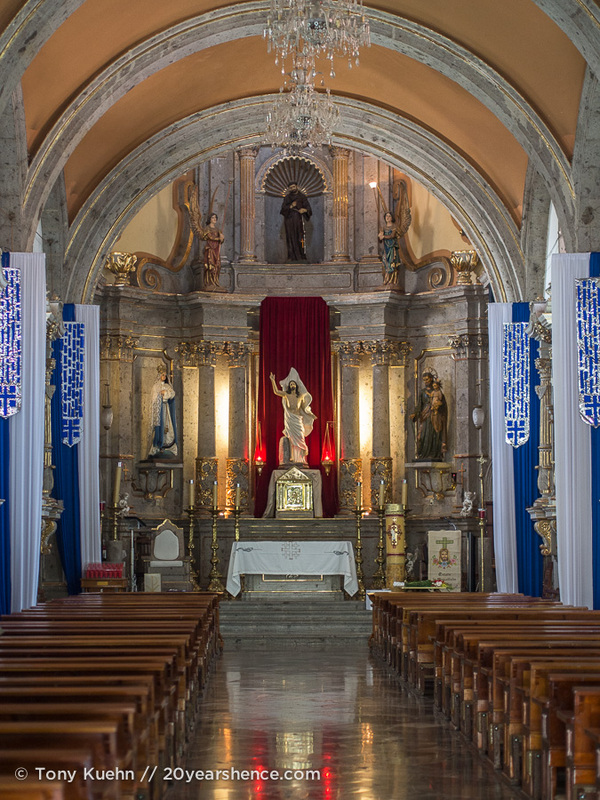 It is generally bustling with activity with both the expat and Mexican population. 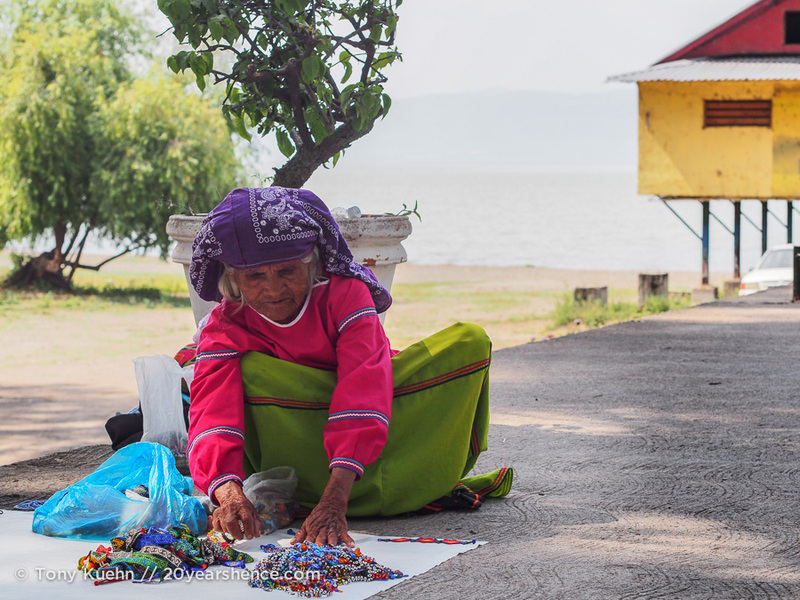 The Lake Chapala area has markets, you just need to investigate when they occur. Monday is the Chapala market, Tuesday the Ajijic organic market, Wednesday the Ajicic regular market, Thursday the Jocotepec market and Saturdays all the street vendors come out along Colon Street and the malecon in Ajijic. Moreover, there is a vendor market on the malecon in Chapala everyday, with more vendors opening on the weekend. 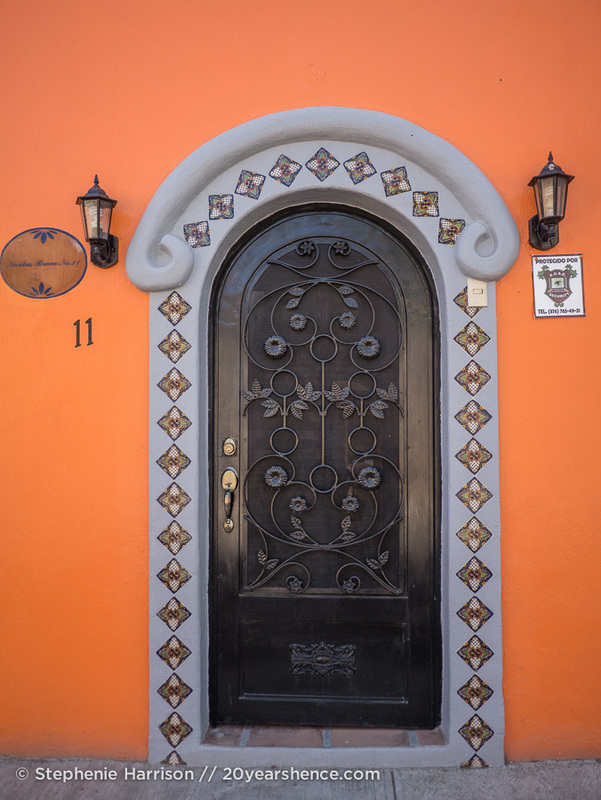 As for activities, there is every activity available in Ajijic a person could desire from volunteering, as Donna mentioned, to pickleball, to trips to San Miguel de Allende or Costco or the beach, to golf groups to jam sessions, to live theatre and very well acclaimed art and literary guilds. Moreover, it isn’t beyond these “retirees” to drive into Guadalajara for a chance to see Phil Collins in concert! Seniors often live busier lives than they did when they worked! They are just more enjoyable ones! In terms too of Ajijic being sleepy, let me just say, there are always festivals happening! The Mexican people will celebrate anything. They love to have a party and dance and sing and this is no exception in Ajijic. A great time to visit is September 10 through November 2 so that you can be there for Mexican Independence and Dia de los Muertos.